Just a minor blip in this morning’s departure, our tyre pressures were down on the rear left hand tyre, according to the on-board diagnostics, so off to a garage to check them out. Conclusion: tyres fine, diagnostics dodgy. We headed east to Dr Arroyo, much quieter now than when we tried to get rooms here a few days ago – it seemed there was a Policia Federales convention in town and all rooms were taken. We missed the turning to La Solidad, La Trinidad and Sandia – no wonder, apparently they were sign-posted to Monterrey! So while Ian realised what was going on and turned around to try some brief stops along that road, we blundered on towards La Ascencion – Ariocarpus Hill, where in March the idea had come to my mind to see this Ariocarpus covered hill in October, during the flowering season. 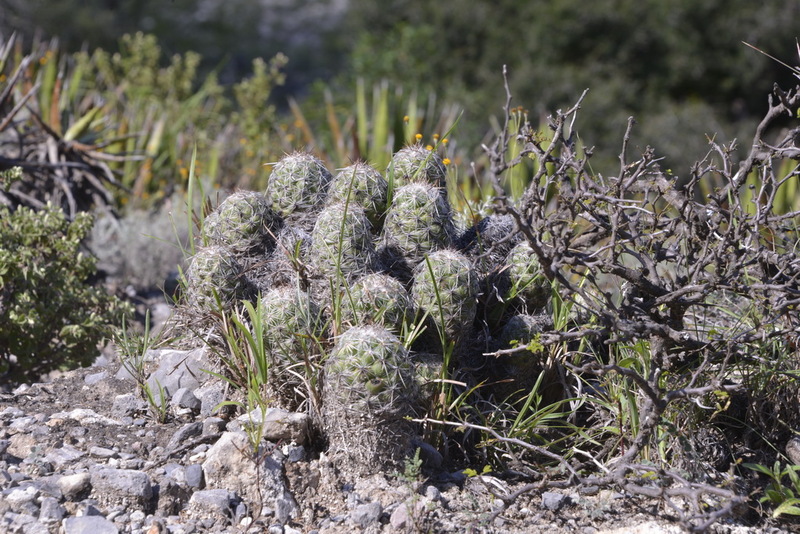 But first an ad-hoc stop along NL 61 with some large Ferocactus pilosus and some clumps of a Thelocactus multicephalus to entertain my camera shutter finger at S3173. 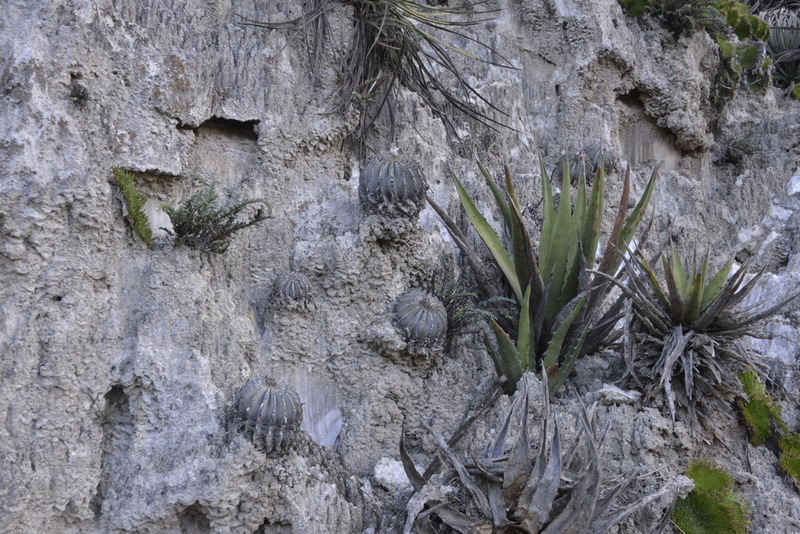 Alain, Bart and I had taken all the images we needed, and more, progressing on to the higher ‘Hill #3’ for the first time – same plants as hills #1 an 2.and it was still early, so we decided to head on to the Geohintonia mexicana site (this time S3175). Again did not know the tract that we were on that leads to the location, trying to send us down a a non existent track. I stuck to my guns and we arrived safely at the spot. The cacti that had previously caused us a head ache to ID looked very pumped up this time, but no easier to give them a reliable name. 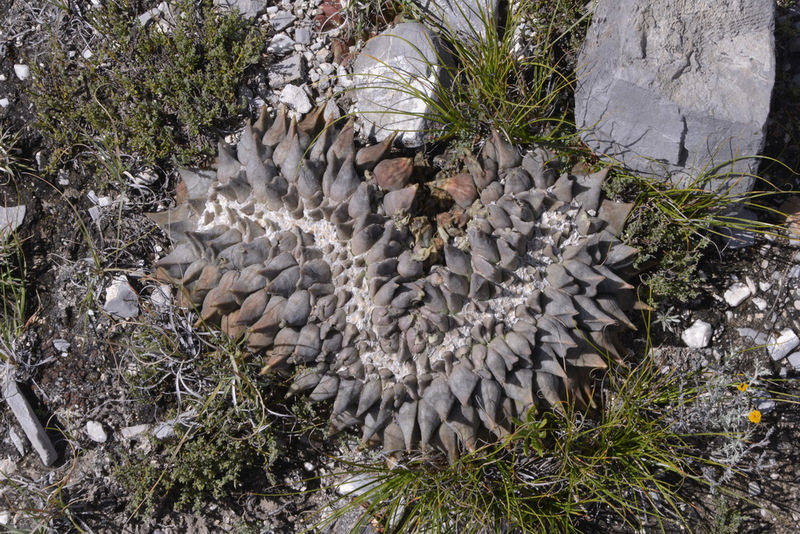 Are they Coryphantha sp? Neolloydia sp? or a Thelocactus? Hey again! 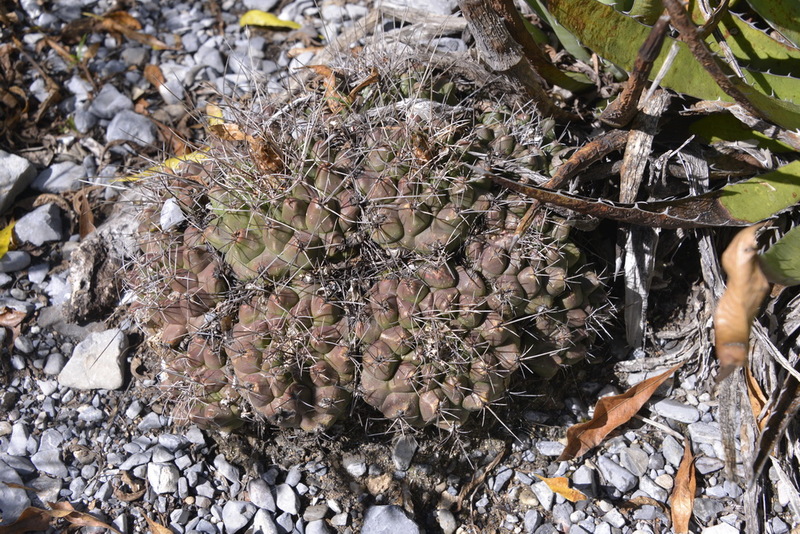 🙂 I think the “Mystery cactus at S3175” is a Neolloydia conoidea.